Dressing For Success. Are You Presenting Your Best Image To Your Patients? This month I’ve been raising money for Movember. Supporting charities while at work can be difficult. I’ve supported various worthwhile causes during my career as a Dentist. Over the years I’ve been a serious fundraiser for various charities. I’ve raised money for Cystic Fibrosis, for Homeless people, for grieving Dad’s…the list goes on. But this month I’ve put my face on the line. Because Movember means growing a moustache. Putting your face where your money is, so to speak. I suppose we haven’t physically come out and asked for donations…. So, although my patients have been supportive with their words, none have been voluntarily forthcoming with donations. I guess they are just separating me the Dentist away from me the fundraiser. It’s a kind of tough one, isn’t it? They’ve just dug into their wallets for expensive Dentistry, and now we’re seen to be asking for more? Because Movember requires a permanent outward display, it raises an interesting question. As a Dentist, what do you wear? I was advising a newly graduated Dentist the other day on just this topic. I told him that when I was a young Dentist, I specifically wore a white Jacket with an open collar so that my shirt and tie were prominently visible to my patients. This made me look older, first and foremost. And that was my primary objective. But I also wanted to “formalize” my relationship with my customers. And the formality of wearing a tie, and dressing well, well, that was just a given. It was what was needed. And I think it’s only respectful, too. As a Dentist, you are a highly regarded member of the community. And how others see you should be congruous with that image. And that’s what’s made Movember such a challenge for me. Because in thirty two years I’ve never ever come to work anything but clean shaven. As a sign of respect for my paying customers. The image you convey directly relates to the way your customers behave towards you. I’m a firm believer in “Do as I do” matching my image. Not just “Do as I say”. And they choose not to do business with people they do NOT like. So in your attire, in your presentation, I say, dress for Success. I know comfort is important, but if I’m going to court, I want my legal team to look like a legal team, not like they just turned up from a stroll in the park. And if I want people to willingly be my clients, well I want to look professional for them. Movember has been fun, but I’ll be glad to farewell my mo next Monday. If you’d care to show your support for my Movember efforts, I would be very grateful. Today, in the USA, it is Thanksgiving Day. I wish all my friends and colleagues a Happy and Blessed Day. I am truly grateful and thankful of the love and the friendship that you all have and show to me. It’s difficult being everything to everybody. And sometimes you just cannot. I heard of two Dental Offices this week that chose to “dismiss” a patient. In both instances, the patient was failing to treat the dentist as a health care professional. In both instances, the patient was choosing to use the Dental Office for their own conveniences, with total disregard of the way their behaviors were impacting upon the Dental Practice. Subsequently, these behaviours were impacting on the other patients being treated by those dentists. Sometimes there are patients who just don’t want to know what’s good for them. Fortunately, not that often. But sometimes there are! Or there are patients who somehow think that the state of their mouth, and its subsequent restoration to health, are all your fault, and not there’s. In these cases, there’s no point trying to reason with these people. Because they have progressed beyond logic. Nothing that you can tell them will be what they want to hear. They want someone to blame for their teeth. They are looking for an argument. They are looking for a tug-of-war. And whenever you come across a patient who is looking for a tug-of-war, the best thing to do, is drop the rope. Because it’s really a total waste of time continuing with someone in this frame of mind. The usual scenario in this case is that for some reason [unknown to the patient] a tooth has deteriorated to the point of being unsaveable, and the patient is incredulous! Despite the fact that the patient has probably not been as regular an attender to the Dental Practice as they should have been. And despite the fact that the patient’s diet may not have been appropriate. And that their level of Oral Hygiene may not have been of the best standard. And in this case, there’s no upside at all to treating an “angry” patient. So send them on their way. Recommend to them that your Dental Office may not be the best place for them to receive their dental services. And end their appointment then and there! There is no upside to your Office in trying to continue treatment on someone who is belligerent. The mental exhaustion and waste of energy to you as the Doctor will drain you for the remainder of your day, thus denying your subsequent patients who do indeed value you, from receiving your best. And that’s not really fair. There are patients who totally disrespect your time. They continually arrive after their appointment is due to begin, and expect to be seen anyway, AND have all their allocated treatment completed. Despite the fact that you don’t now have sufficient time. They ruin your day because of their complete disregard for the importance of your time. Again, in this instance, the relief you gain from letting this sort of patient go, letting them find a new Dental home, can be enormous. As if a weight has been lifted from your shoulders. We weaken. We see them anyway, and then spend the remainder of the day playing catch up, running behind for all our other patients, and getting “a name” for being late, despite the fact that this patient has caused us to run behind. So put your foot down! After all, you’re a health care professional, with years of time spent gaining an education. And now you occupy a business that cost to acquire. And that “history” needs to be shown some respect. There comes a time when there’s no point in continuing the relationship with these patients. Because, again, it impacts upon the quality of care that you want to give to the remainder of people you intend to see that day. And that’s not fair on them. It’s important here not to appear arrogant about your worth. It is important here to feel your worth is of some importance though. And when you feel that you’re not getting back, then it’s time to end it. Because it is OK to not be everything to everybody. It is OK to let some patients go…. Words of wisdom from Kenny Rogers. A very wise friend of mine, Rocket Rod Sercombe, rang me this week from Mackay. He’s excited!! Really excited, and rightly so. But it was Rod, who told me these words, seventeen years ago. And Rod IS NOT a dentist. But he’s a sage. And sometimes I wish I had his street smarts. I’ve been watching a couple of colleagues of mine this week for want of a better term, “arguing” over the right of being right. One of these colleagues was alerted by a friend that one of her employees was, unbeknown to my friend, seen out looking for employment. Well my friend saw red. She felt betrayed, and violated. But sadly, that’s the way employment law stands. The pendulum has been swung so far toward the employee and away from the employer. And if that’s how it is. Fair or NOT fair, really doesn’t come into being a factor. If you want to sky dive, there’s no point complaining that the wind is going to mess your hair. That’s just how it is and that’s just how it’s going to be. And although I’ve never jumped out of an aeroplane, I imagine it’s much like doing a flying-fox, or zip line, which I have done. I did my flying–fox ride across Telstra stadium, which was the main arena for the Sydney 2000 Olympic Games. And when I did it, when I was finally over the railing and in position ready to go, I realised, that to “back out” and to climb back over the rail, was going to take far more effort and stomach muscle than simply “stepping off”, and taking that one step, and flying…. And this was the advice to my colleague, who felt slighted by the departing employee. You see the employee firstly said no, she was not leaving, however soon after, tendered a two weeks notice of resignation to my friend. And then the following day, called in sick, and said that she would be on paid sick leave for those two weeks. Now my dentist friend was outraged. As we all would be. But that’s the tide in the river. That’s the rapids we have to be dealing with. My friend does not want to pay the sick leave, which she believes to be fallacious. But pay it I will. Because I wouldn’t want to fight the battle of being “right”. You see, sometimes winning the battle, but losing the war, is not worth it. Pay the employee what she wants, and consider it money well spent in the Lessons of Life. And it may be an overpriced, expensive lesson? But a year from now, two years from now, it will be money well spent. Kenny said it: “the secret to surviving is knowing what to throw away and knowing what to keep. Is The Art Of Problem Solving Missing At Your Dental Office? There’s a simple lesson to all businesses out there. The lesson is out there, yet so many businesses are not heeding the lesson. And I’m really not sure why not. Make your customers feel important. Is this message being lost as it passes from those at the top making decisions to the people working on the front line? Or are the people on the front line incapable of doing, or seeing, what’s best for the customer? Just this week I’ve experienced two situations with two big businesses that didn’t really give a rat’s about helping me, their valued customer. Or in making me feel valued, as their customer. And sometimes it’s that way in the Dental Office as well. Sometimes while the Dentist owner is busily working away treating patients there are members of his team doing nothing, or not much. I mean, doing absolutely zero. And sometimes while the Dentist is busy treating patients there are team members answering the phone abruptly, or being less than courteous when it comes to dealing with patients both in the Office as well as on the phone. “But that doesn’t happen in my office”. Sadly it happens all the time. Do you think the CEO of Telstra is concerned that I spent over two and a half hours on the phone today trying to have my ADSL Broadband service reconnected after someone at Telstra accidentally had it disconnected. Do you think Telstra cares that the way I was treated by them, my “experience” if you will, was far from world class? And sadly, “We are truly sorry for sucking two and a half hours out of your day Mr. Moffet, and here’s what we’re going to do to make up for our inconveniencing you” said no Telstra employee ever. My second encounter of brains playing second fiddle came at San Diego airport this week, where I was checking in for my flights home to Sydney via LAX..
I’d arrived early for my 725pm flight, and upon my arrival at American Airlines check in, not only did I find out that my flight was going to leave later, but also, that I was not at the correct terminal. I needed to catch an airport loop shuttle bus to the American Eagle terminal. On this bus were two other people who told me they were due to catch a 615pm flight to LA. There was still time, they said. So, when I checked my bag at the American Eagle counter at this “terminal”, I asked the agent checking me in whether the American Eagle “terminal” had a lounge for American Frequent Flyers and Club members. I asked him whether he thought I should go on the 615pm flight to LA, as it was yet to depart, and he told me no. On following his advice I passed through security, only to find there was no Admiral’s club in this San Diego “terminal”. There was no lounge, period. Just gate seats. How was I ever going to prepare for my long trip home over the Pacific? Quickly, I summed up my options and went to the gate, where the 615pm flight to LA was beginning to board. “Are you able to find me a set on this plane to LA?” I asked. The lady checked her computer…. And issued me with a new boarding pass. On the 615pm to LAX. Where they have an Admirals Club lounge. Why was my first American Eagle attendant so unhelpful? Why was he not attuned to my need for a comfortable place to rest up before my near twenty-four hour journey home? Both the American Eagle check in person, and the Telstra people I dealt with, were caught up in protocol and procedure, and appeared to be in no way concerned with problem solving and Service Recovery. Wouldn’t it have been wonderful if the American Eagle man checking my luggage had suggested I race through and board the 615pm to LA, because the facilities at LAX are far more comfortable than those at his San Diego terminal. Sadly, in both company’s cases, Customer Service Eyes were not switched on. In both instances, I felt as though nobody really cared to make me feel important, as Mary Kaye Ash would say. Is that desire to problem solve, to make someone’s day, being lost in today’s busy world? “Hey, things are different here”. From every other Dental Office around. And from most, if not all, other businesses out there. I don’t know what it is about being a dentist in private practice, but some days I certainly feel that as a vocation, we are walking around dead set with a bulls-eye target stapled squarely in the middle of our backs. A bulls-eye target visible to the whole world but totally invisible to us as dentists, both individually, and as a group at large. Other dentists cannot see the bulls-eyes on our backs. We cannot see the bulls-eyes on our own backs. And most of the time, our spouses also cannot see these targets. The public can see them. And often, these targets are so so visible to the public that they form a line to take multiple shots at your target. This week I have been reminded of this fact. Two of my colleagues have openly shared some human resources [HR] and industrial relations [IR] stories in an online dental forum. On the surface their tales seem like pure fantasy. Well, I’m here to tell you, it certainly can happen to you. Despite your best intentions, as a small business, with often less than five or ten employees, and as a self-employed business owner, you’re a prime target. Because you’re a technician, as Michael Gerber says. You’re not really a business owner. 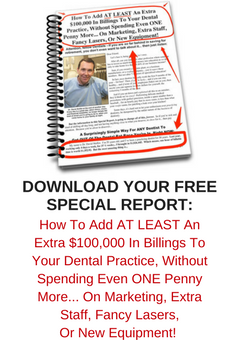 In buying or setting up your Dental Practice, all you’ve really done is buy yourself a job. With all the headaches of owning a small business. All you’ve really done is buy yourself a job with no boss. Or in reality, you’ve bought yourself a job with a lousy boss. Because you’re ill equipped as a business owner to handle the snipers who want to take aim at your loud and livid bulls-eye. You see, in reality, you’re not a business owner. Business owners sit in their offices and oversee their domain. They watch it, and monitor it. They have their finger on the pulse. Or you’re being a dentist. And because of this, you’ve got your eyes in somebody’s mouth all day. And not on your business. Well, I’m here to tell you, it can happen to anyone. Advantage is taken by any person who sees opportunity and vulnerability. And in dentistry, as an employer, you *ARE* a sitting duck. When you smell a rat? Seek professional help. From an IR specialist.